Once I got it paired with my radius 270s my opinion of the sub really improved. 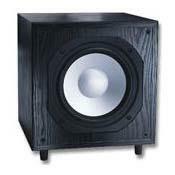 The sub-speaker transition is seamless and has great depth and resonance without being boomyor poppy. The system sounds real. Before I got my Monitor Audio Radius270 I had a set of Mirage 2 ways not sure on the exact model, and the sub was punchy never smooth too much emphasis on the sub. No such problems when mated to the 270s!